Raptors are powerful with very strong beaks and talons (claws) with which they catch their prey. All raptors are protected by legislation in Australia and have been since 1971. When identifying different birds of prey look for their size; the shape of their wings when gliding; the colour of their legs and feet; the shape of their tail; eye colour; colour of crest; face markings and their call when in flight. Common problems encountered for raptors are entanglement (barbed wire and fishing netting/lines/hooks), feather damage and motor vehicle collisions causing fractures, concussion, head, eye and body trauma. Raptor rescues must be done by a trained raptor handler. Birds of prey found on the south coast include spectacular soaring Wedge-tailed Eagles, White-bellied Sea Eagles, Nankeen Kestrels; Peregrine Falcons; Whistling Kites and Swamp Harriers. As their name suggests, birds of prey hunt for live prey, usually vertebrates and sometimes other birds. They have different diet preferences, fish as well as lizards, insects and rodents such as mice and rats. 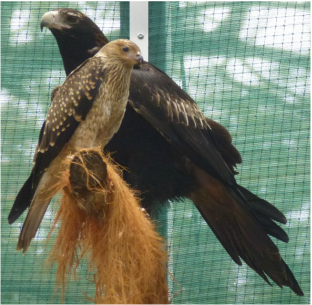 ﻿ ﻿Wedge-Tailed Eagles (Aquila audax) are the largest Australian raptor; dark, legs heavily feathered to feet; long tail overall diamond shaped, the tip is a pointed ‘wedge’. This eagle is often seen at roadkill as it usually nests as well as hunts over open country but also will nest in forests. White-bellied Sea Eagles (Haliaeetus leucogaster) have a wing span of over two metres. Adults have distinctive white heads, chests and tail with beautiful grey and white underside wing markings - and are completely grey on top of their wings. Australian Nankeen Kestrels (Falco cenchroides) are one of the most commonly-sighted birds in Australia - often seen hovering over their prey in farm paddocks. They are a small raptor with a reddish/brown upper body with some dark streaks. Adult males have grey heads and tails, while females have a brown head and reddish/brown tail and are larger than the males. Peregrine Falcons (Falco peregrinus-macropus) are primarily bird eaters. A large falcon, the Peregrine is known for its amazing speed, reaching over 322km per hour, as it stoops* and strikes its prey. Peregrine Falcons have darker feathers on their heads and around their beaks, known as a malar stripe. The feathers on its back are also dark. When flying its wing tips are sharply pointed. The Swamp Harriers (Circus approximans) are generally brown with an owl-like face, long yellow legs and eyes and distinctive long, broad wings which spread out to form five finger-like tips. Light blue-grey gradually replaces the brown, especially on the tail and flight feathers with age. They use a combination of keen eyesight and hearing to hunt large insects, frogs, reptiles and small mammals up to the size of hares or rabbits, gliding on their long broad wings and circling low over grasslands and marshes. They nest on the ground. Whistling Kites (Haliastur sphenurus) like Swamp Harriers also have distinctive wing tips. While it is also brown and could be mistaken for the Swamp Harrier the Whistling Kite is more hawk-like in its appearance and more scraggly. Often glides low around treetops; deep, slow wing beats with undulation of body. It also makes a loud whistling call in flight. Scientific studies have confirmed over the last few years that all birds are sensitive to light in the ultraviolet band. This UV sensitivity plays an important role in successful hunting for birds of prey. Nankeen Kestrels for example are able to trace the urine trails of small rodents because the trail absorbs UV light and they see the trail, invisible to a human eye. Birds of prey have always been known for their keen eyesight and the ability to hunt small animals at a distance - this expanding research is now providing remarkable insight into how these animals are able to survive. Visit the bird field guides and PDF brochure downloads in the Wildlife Information section to learn more on birds in WRSC licenced area. * Stoop: The swift, steep dive of a hunting raptor. While many raptors dive upon their prey, a stoop is characterized by a steep angle and fast descent with wings pulled in for maximum speed and aerodynamics. The steep angle not only helps the hunting bird gain greater speed, but also serves to surprise the prey and give more force to the strike impact. A bird may begin a stoop while soaring or simply while in basic flight.